How many decks have you bought or made that over age become twisted. The deck may have been left in the sun too long or left beside a heat source. The results of this can ruin a board. Uneven drying of veneers is something most of us have encountered. Here is a quick fix. 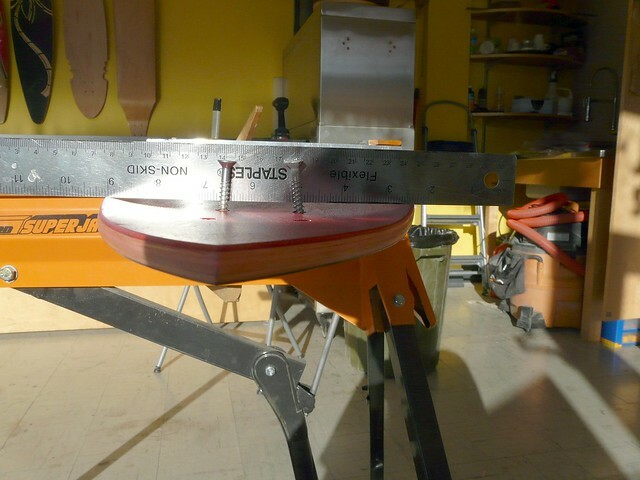 Take your board and clamp one end to a table using a light duty woodworkers clamp, top side up. Take two straight edges and position them as far away as possible. One on each set of truck mounts works great. Position them as shown in the picture. I ususlly put a couple of woodworking screws into the truck holes to lean the straight edges against. From the front of the deck eye along the tops of the strait edges. This will clearly show you how much your deck is warped. 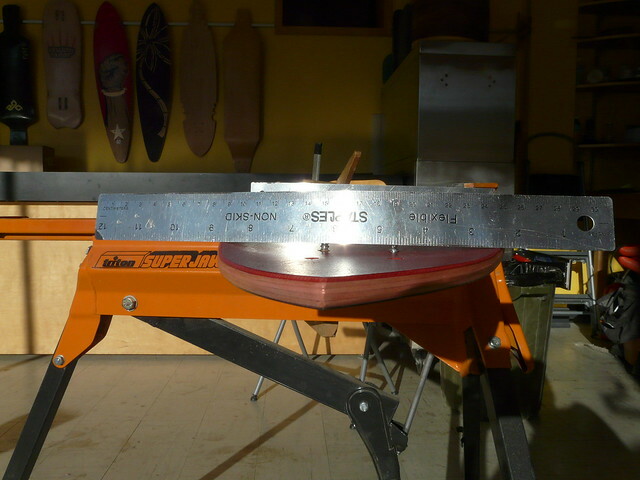 The left front side of this deck is warped downwards about 1/8th of an inch. Once you have determined how much and where the board is warped, place a 1 x 2 piece of wood in front of the truck holes. 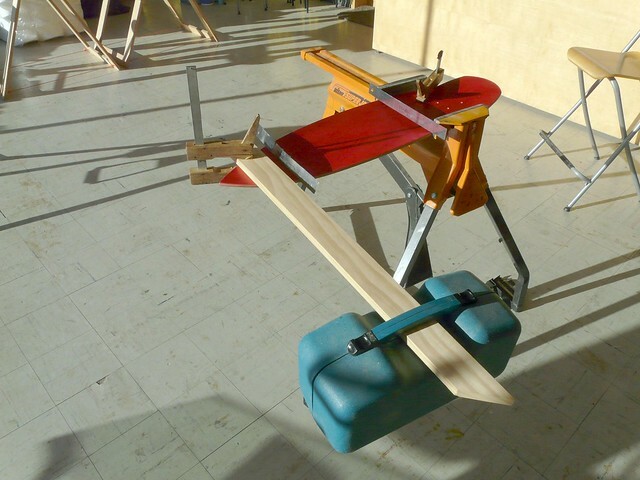 Clamp it so the length of wood sticks off in the direction of the high point of the warp as shown below. Find something you can slide back and forth on the wood that has some weight to it. This makes it possible to adjust the weight depending on the amount of warp your deck has. I try to get the deck to warp slightly in the opposite direction. You can check how much opposite warp you have by aligning up the two straight edges. 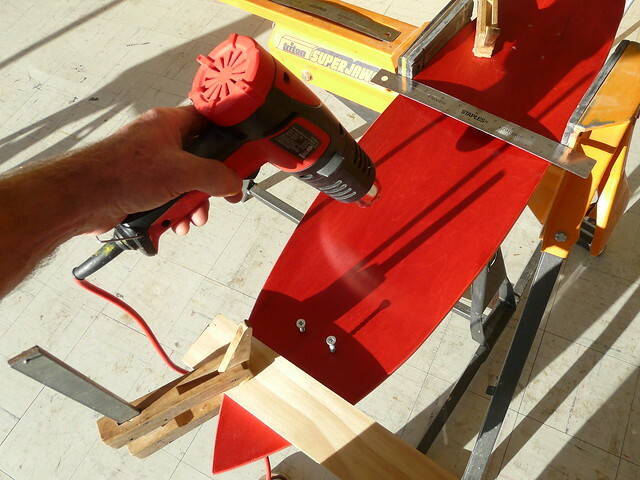 Using an industrial heat gun, wand it over the surface of your deck in a lengthwise motion. I place it about 2 inches from the deck but keep it moving constantly to prevent the wood from burning. A deck this size takes around 5 minutes to heat up. Wand along the edges of the deck, slowly moving towards the middle. Once the wood is good and hot, give the 1×2 a couple of pushes down, this will twist the warp out of the deck. Be careful as it is easy to over twist your deck. Keep checking your straight edges. Once the deck looks straight leave it to cool down. This will take at least 15 minutes. Your warp should be gone. What we have done is to soften the glue using the heat. This allows the veneers to shift slightly as you bend your deck. This will also work, heating the bottom of the deck if you have gripped the top. I have not tried this on a production deck but it works great with any custom deck that was built with water based glue like Titebond III. After it has been twisted back. I will sometimes sponge the board lightly with water to cool it down and put some moisture back into the layer if veneer. I really appreciate this post! I had a Bombsquad Rambo Bazzoka that had a massive 3in warp in it. Went through all the steps and its straight as an arrow now, thanks again! 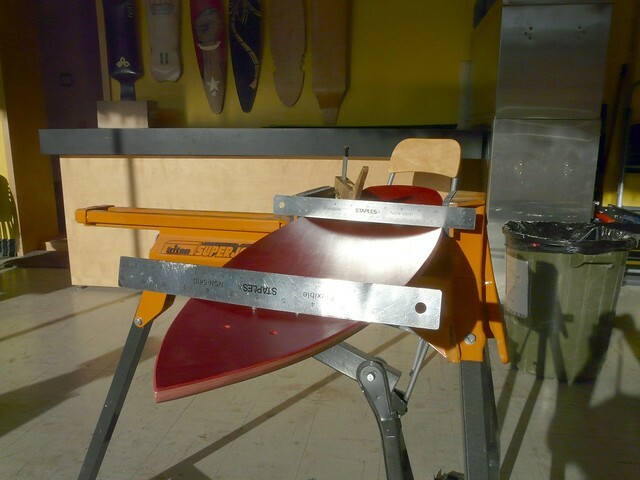 Can this work for boards that are fiberglassed? I just made a board and fiberglassed it in a bag which made it warp a little bit so I was going to straighten it out like this but was wondering if the heat will affect the fiberglass at all? I am not sure about a fiberglassed board. Try it, I do not think it will harm the fiberglass as the resins will not melt.